Investors are risk averse. The only acceptable risk is that which is adequately compensated by potential portfolio returns. Markets are efficient. It is virtually impossible to anticipate the future direction of the markets as a whole or of any individual security. Therefore, timing the purchase or sale of investments in the attempt to “outperform the market” is highly unlikely to increase long-term investment returns; they also can significantly increase portfolio operating costs. It is unlikely that any portfolio will succeed in consistently “outperforming the market”. The design of the portfolio as a whole is more important than the selection of any particular security within the portfolio. The appropriate allocation of capital among asset classes (stocks, bonds, cash, etc.) will have far more influence on long-term portfolio results than the selection of individual securities. For a given level of risk, an optimal combination of asset classes will maximize returns. Diversification helps reduce investment volatility. The proportional mix of asset classes determines the long-term risk and return characteristics of the portfolio as a whole (diversification does not guarantee against market losses. It is a method used to help manage risk). Portfolio risk can be decreased by increasing diversification of the portfolio and by lowering the correlation of market behavior among the asset classes selected. Correlation is the statistical term for the extent to which two asset classes move in tandem or opposition to one another. Equities offer the potential for higher long-term investment returns than cash or fixed income investments. Equities are also more volatile in their performance. Investors seeking higher rates of return must increase the proportion of equities in their portfolio, while at the same time accepting greater variation of results (including declines in value). When looking at securities there are two types of risks. 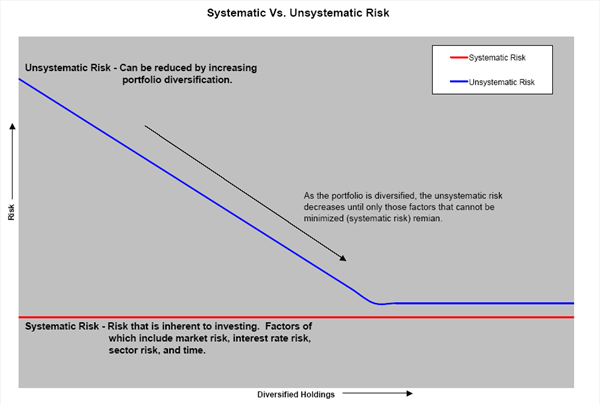 The first is systematic risk, or sometimes referred to as market risk which cannot be diversified away. The second is unsystematic risk or company specific risk which can be reduced by increasing portfolio diversification (see chart below). We believe that a diversified portfolio of assets can give you the best risk/reward scenarios. When looking at the volatility of the portfolio, it isn't as easy. It is very important to look at the correlation of assets to one another because the lower the correlation to each other the more diversification benefits there can be. NOTE: Diversification does not guarantee against market losses. It is a method used to help manage investment risk. 1. Risk Required - this is the risk that is associated with the return the client needs in order to achieve their goals and objectives. 2. Risk Capacity - this is the amount of risk the client can afford to take. 3. Risk Tolerance - this is the level of risk the investor is comfortable taking. 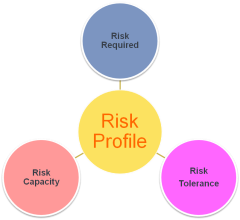 Click here to read 'Risk Profiling: Art and Science' a comprehensive discussion on risk by FinaMetrica. 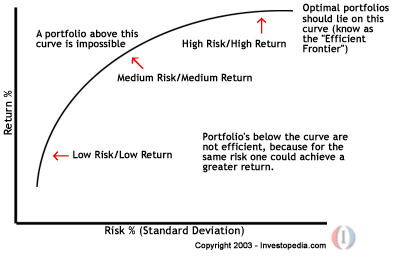 The efficient frontier represents the most efficient portfolios for each level of risk. If the portfolio isn't on this line then there is a portfolio that exists with a better risk/return trade-off. Each investor’s level of risk aversion will dictate what type of assets to include, and at what portions, in the optimal portfolio for that investor. Our general investment philosophy is to use a combination of both active and passive management styles. We believe, and studies have shown, using a passive investment management style in areas of the capital markets that are more efficient can be beneficial. We also believe that some areas of the market are less efficient and as such, a more active management style might be more appropriate.